That was the theme of the day but the potd doesn't reflect that at all. First about the pool. The girls were invited to a birthday/farewell party for their friend Grace. The party was way south of town so I decided Kade and I could spend some quality time with my sister-in-law and her kids that live close by. Everyone had a lot of fun. The girls did not want to leave when I went to pick them up. They somehow managed to get an extra 30 minutes of swimming out of me. We made the ride home dropping off a few friends along the way. We ate dinner and had Family Home Evening. Meg had the activity for the night. She picked a bike ride. Mickey and I didn't know how this would work since Mat doesn't really want to ride her bike and Kade's bike no longer has training wheels and didn't want to do the whole ride being held. Long story short, we made it around a huge block without anyone getting hurt. (That's a big improvement from our last attempt at a family bike ride.) 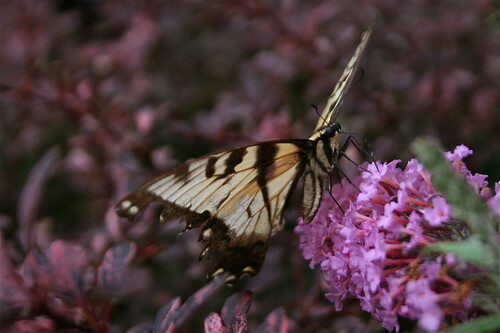 When we came home I noticed a butterfly fluttering around the butterfly bush we have out front. I ran for the camera because I have been waiting for an opportunity to shoot one. Here it is. The little bike ride had left me wanting a longer one. I put Kade to bed after he and Mickey finished putting my new dresser together and went for a ride around the neighborhood. It was so much fun. There are all kinds of hills and curvy roads to drive on. I think a third of the ride I got to coast but I really had to work to get up the next hill. The only way it could have been better is if Mickey had come with me. Maybe next time. A butterfly bush? That's beautiful. Especially with the butterfly. And yey for neighborhoods you can bike safely around! That is one great looking photo.